Today the Senate Agriculture Committee held its first hearing of the year on the 2012 US Farm Bill, a $288 billion behemoth best-known for setting farm subsidy and other agricultural policy. Although it rarely receives top billing, the Farm Bill is the central legislation that guides the US government’s global food aid programs. Here’s the long and the short of it: the US Food Aid program is immensely important, but right now it is broken, seriously hampered by special interests who lobby Congress to impose regulations that protect their bottom-line at the expense of hungry people and taxpayers. These regulations cause less food to get to the hungry people who need it with up to 32 cents out of every $1 spent on food aid going to waste as a result. To put it succinctly, the regulations cost money and lives. 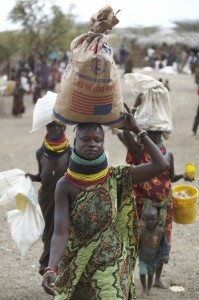 Families collecting their WFP monthly ration at an Oxfam distribution point in Northern Kenya, March 2011. Photo by Andy Hall. For years these rules have been protected by a group of well-heeled lobbying organizations representing the shipping industry and the major commodity trade groups including the American Cargo Transport Corporation, the National Corn Growers Association, and USA Rice Federation among several others. Case in point, this letter sent to members of Congress in 2010 by DC lobbying firm Winston & Strawn on behalf of industry groups opposing reform. These groups have joined hands to fight against common sense changes that would make our food aid program more effective at saving lives and more cost efficient for US taxpayers. But it’s time for the craziness to end. And the 2012 Farm Bill is the place to make that happen. That’s why Oxfam America and some of our friends and allies are standing up to take on the special interests that are getting in the way of life-saving reforms. We hope you’ll join us. For more detail on the issue, see the memo we put out this morning highlighting three ways that Congress can fix the food aid program. And stay tuned to this space for more. Helping hungry people during food crises is an essential part of US foreign policy; it reduces instability around the world and protects the most vulnerable communities from catastrophe. But under the current law, special interest lobbyists are having a field day with our food aid program, imposing rules and regulations that benefit themselves, cost lives, and waste taxpayer dollars. These regulations cause less food to get to the hungry people who need it with up to 32 cents out of every $1 spent on food aid going to waste. For years, a group made up of well-heeled lobbying organizations representing the shipping industry and the major commodity trade groups including the American Cargo Transport Corporation, the National Corn Growers Association and USA Rice Federation, have joined hands to fight against efforts to make our food aid program more effective at saving lives and more cost efficient for US taxpayers. These groups push Congress to impose regulations which require that food be purchased from preferred growers and shipped from the US on preferred ships instead of finding the best prices and sources of food that will save the most lives and reduce dependence on aid in poor countries. This red-tape directly benefits the industries these lobbyists represent at the expense of hungry people and taxpayers. Independent studies have shown that these rules cost taxpayers approximately $213 million a year, a massive chunk of the relatively small food aid budget. Shipping restrictions alone cost taxpayers on the order of $140 million in one recent year. Think of the lives that could have been saved if that $140 million could have been spent on food and agriculture programs instead of unnecessary overhead. What’s worse, the regulations contribute to delays in food deliveries of up to four to six months, delays that can mean life or death for people in crisis. The rules also hurt small-scale farmers when US food aid is dumped on developing country markets. Rather than helping communities build a bridge out of poverty and hunger, these rules contribute to a cycle of poverty and dependence for small-farmers and hungry people. America is better than this. It is time to put the interests of hungry people and American taxpayers ahead of industry lobbyists by reforming food aid’s wasteful and ineffective regulations in this year’s Farm Bill. These reforms must allow for food aid to be purchased locally and regionally within developing countries and put an end to the use of life-saving aid doubling as corporate welfare. These fixes will save lives and ensure our aid helps build self-reliance, enabling local farmers to thrive and reducing the need for assistance over the long term. 1. Expand the use of local and regional purchasing of food aid. The 2008 Farm Bill created a small pilot program for local and regional purchase of food to prove that it can be done. Rigorous evaluation of this program has demonstrated that it can. Where appropriate, local and regional purchasing is a cost-efficient and effective model to save lives and enable communities to build pathways out of poverty. The current pilot should become a regular program and receive funding as part of the core food aid program. 2. Use food as food, not a source of fundraising. Some organizations that deliver food aid are forced sell it to food traders to raise cash to fund their food aid programs. It’s perfectly legal, but totally inappropriate. This process, known as “monetization” is extremely inefficient and can damage local markets, hurting farmers and undermining food security. Food aid must be used to save lives not as an inefficient and wasteful way to generate funds for organizations providing food assistance. The US must eliminate the “monetization” of food aid. Congress must provide organizations delivering food aid with adequate funding so that they can deliver lifesaving programs without having to sell off food to keep the lights on. 3. End costly shipping restrictions. By law, at least 75 percent of US food aid must be shipped on preferred US ships. This rule wastes money, costs lives and creates an unnecessary burden on USAID that hampers quick and effective response in times of crisis. It is wrong to use emergency food aid that is intended to save lives as corporate welfare for the shipping industry. Special set asides for the shipping industry should be stripped from the Farm Bill. Is Oxfam not a special interest? Thanks for your question Brian, nice to see the Seafarers taking an interest in the issue. Oxfam America advocates in Washington for social justice and for lasting solutions to poverty and hunger. We do not accept US government funding. You can choose your own definition of a special interest, but I’d say the more important question is whether the small sliver of funding that goes to food aid should be spent to have the greatest impact and save the most lives possible or if it should be spent to support the bottom lines of industries with the most powerful lobbying operations? Of course we’d take an interest in the issue – the livelihoods of tens of thousands of union members and the working families who we represent are dependent on continued federal support for Food Aid. It is disingenuous for you all, however, to attack “well-heeled lobbyists” when Oxfam America itself has spent over $3.3 million on lobbyists. It’s easy to throw around the phrase “special interests,” but you guys are living in a glass house on this issue. It would be easy for me to ask if that money wouldn’t be better spent on programs to feed people, but I understand the importance of advocacy and I give you guys the benefit of the doubt as to why you do it. I won’t get into the factual inaccuracies of what you have written here, as we’ve refuted these arguments a couple dozen times already. What I will say is that instead of attacking us, it would be better for all of us to be working together to ensure the continued viability of these programs. We have been fighting hard to ensure strong funding and the continued existence of the programs. The real question you should be asking is what would happen if there wasn’t a strong coalition of interests supporting Food Aid. Would the program even be around today? We should be partners working on this, not arguing about it. My office doesn’t have any windows so I’m pretty sure it’s not made of glass. We would welcome the opportunity to work together towards a stronger program that saves the most lives possible. Certainly we recognize the importance of protecting the livelihoods of mariners and their families. But we simply don’t buy the claim that protecting working families must come at the expense of people facing crisis. There are better ways to ensure mariners get a fair-shake than to prevent aid programs from operating effectively. Moreover, suggesting that support for US food aid programs will disintegrate without the backing of industry lobbyists is a transparent attempt to scare aid advocates away from telling the truth about the system’s inefficiencies. It’s also a straw man that doesn’t stand up to real scrutiny. In reality food aid programs will not fade away if the regulations that hinder its effectiveness are finally removed. Just the opposite. The most successful strategy to defend and promote aid programs is to make them work and show their impacts on the lives of poor people. Is Oxfam aware of the MSF program “Starved For Attention,” which discusses the nutritional issues behind USAid? Many farmers, for instance, are unaware that we are sending what amount to empty calories (CSB) overseas as food aid. Even USAid itself, with the aid of Tufts University, has concluded that the current formulation of CSB does not offer sufficient nutritional support. Food lobbyists are rallying to prevent changes in CSB as well. Thanks for the note Michele. We’re very aware of this issue and are advocating for changes in the program that will try to make sure that the food given as part of the Food Aid program is actually nutritious enough to keep people healthy. 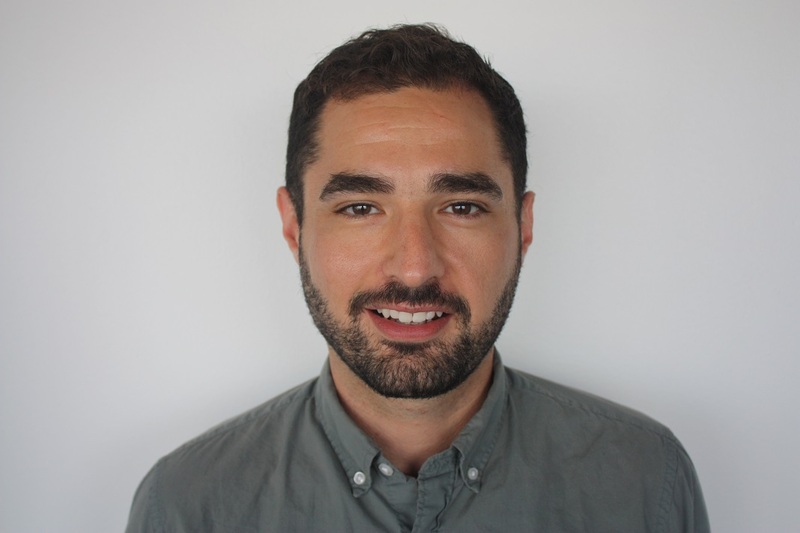 Ben Grossman-Cohen is Oxfam America’s Global Campaign Manager, based in Oxfam America’s Washington DC office. Prior to joining Oxfam, Ben served as a consultant to mission-focused organizations working on a broad range of food, climate, energy, and international development issues. From Kenya to Washington: Who’s to blame for wasted food aid?